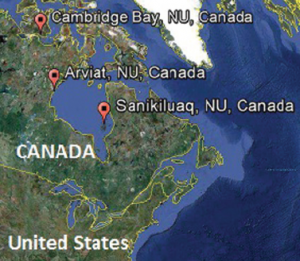 The Nunavut Wildlife Management Board is using the Mesa to conduct a community-based wildlife monitoring program throughout the Canadian Arctic territory of Nunavut. In each of three Nunavut communities, groups of native Inuit harvesters are employed to collect wildlife data using the Mesa along with custom software developed by Noreca Consulting. While traveling by land, the Inuit hunters use the Mesa to log travel routes, mark GPS coordinates of wildlife catch and sightings, capture geo-tag photo images, and record a range of other species and environmental data. Once each hunter returns to the community, the data stored on the Mesa is synced and uploaded to the main database online. This wildlife monitoring program aims at helping researchers and policy makers better understand the health of Arctic wildlife communities and harvest levels across Nunavut. From the project database, users can access and view geospatially referenced data and images of some of the earth’s most unique species such as polar bears, walruses, beluga whales, and caribou, as well as the traditional travel routes of Inuit hunters. We thought this was a really cool use of the Mesa Rugged Notepad. If you’d like, you can read more about this application here. 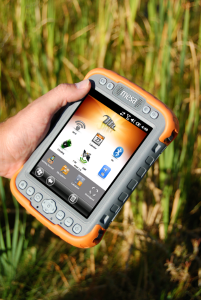 Do you have an interesting application for your Juniper Systems rugged handheld? Comment below and you could end up featured in one of our blog posts!